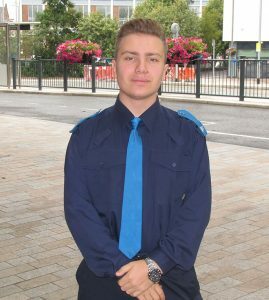 Eighteen year old police cadet, Mateusz Strzeszewski from Blackburn, has been shortlisted in the prestigious national Lord Ferrers Awards 2016. The awards, run by the Home Office, recognise the contribution police volunteers make to policing. Mateusz was nominated by his cadet leader for his commitment to the cadets. He joined in 2014 because he had always wanted to be a police officer and to make a difference in his community. He quickly proved himself to be invaluable to the cadet scheme. At the June 2016 Volunteer Police Cadets National Conference Mat led a young adult leader’s session on the ‘Honest Truth’ a road safety awareness project and he has since developed an training package, which he will deliver to other young people in his area. Mat has also been involved with the local Rotary group, taking the lead on an apprentice style challenge, where cadets made and sold candles for the Rotary. He spoke at their annual conference, at a local meeting about cadets and helped with a senior citizen outing. He recently organised a family fun day for the junior cadets and supported a group on their DofE expedition. The volunteer police cadet scheme is part of the Lancashire Police citizens in policing programme. It now has 650 cadets across 10 units across Lancashire. Police cadets help and assist in the community by getting involved in a number of activities, including stewarding local events such as fairs, town shows and carnivals. They also help the local neighbourhood policing teams carry out leaflet drops, crime prevention initiatives, community safety events and street surveys. Since October 2015 the cadets have provided more than 18,000 hours of volunteering service. All winners and runners up of the Lord Ferrers Awards will be presented with their awards by a Home Office minister at a ceremony in September.